When and Where was she Born? 12th May 1820, Villa Colombaia, near the Porta Romana, Florence, Italy. Florence Nightingale was the second daughter of wealthy parents, William Edward Shore (He adopted the name Nightingale to get his inheritance) and Frances Smith, wealthy daughter of a Unitarian family and Liberal politician. Taught at home by her father who was Cambridge University educated. 1821: The Nightingale family return to England from Italy. They settle in her father’s Derbyshire property which has a lead smelting works in the grounds which her father manages. Their father has another property called Lea Hurst built in the nearby village of Lea which is to serve as their summer house for the rest of Florence’s life. 1825: Family move to Embley Park in Wellow, Hampshire. 1837: Florence Nightingale states that God has called her to his service but at this time she is not fully aware what that service will be. Family travel to Europe in September and she meets Mary Clarke in Paris. 1839: The family returns to England in April. In June Florence and her Cousins are presented to Queen Victoria at her Birthday Party. The family move back to the renovated Embley Park in September. 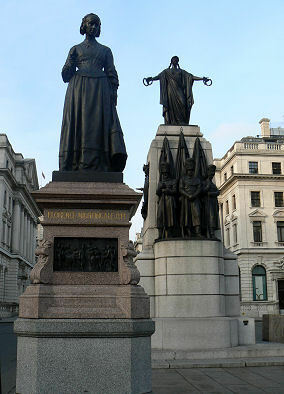 1842: Florence Nightingale meets Richard Monckton Milnes. 1844: Florence asks Doctor Howe if it would be acceptable to devote herself to charitable works in hospitals like the Catholic nuns. She refuses a proposal of marriage from her Cousin Henry Nicholson. 1845: Florence Nightingale wants to train in the nearby Salisbury hospital but her parents are horrified as this is not a respectable job for a well brought up lady. 1846: She begins to train herself about hospitals from the Government Blue Books. 1847: Richard Monckton Miles wants to marry her but as she is verging on a nervous breakdown she travels to Rome with friends. 1848: She attends the opening of Sidney Herbert’s Charmouth convalescent home and at last her knowledge is recognised. 1849: She finally refuses Milnes proposal of marriage. (December) She accompanies her friends the Bracebridges on a trip down the Nile in Egypt. 1850: They then continue on a trip through Europe. In July she visits the Kaiserwerth Institution on the Rhine. Pastor Theodore Fliedner asks her to write a pamphlet about Kaiserwerth. 1851: Florence Nightingale begins to study at Kaiserwerth. 1853: Her father gives her an allowance of £500 to continue her studies and she opens a nursing establishment of her own for “Gentlewomen”. 1854: Beginning of the Crimean War. Sidney Herbert as Secretary of State for War asks her to nurse British soldiers. She takes a party of thirty eight nurses to the Barrack Hospital in Scutari, near Constantinople in Turkey. She is surprised by the lack of facilities and despair of the doctors but decides to try and lift spirits. She becomes a heroine to the troops and songs and poems are written about her. 1855: A public subscription is raised in Britain to assist her work. She becomes ill with Crimean fever. 1856: As the War is over Florence returns home to Lea Hurst. She is invited by Queen Victoria and Prince Albert to talk to them about her war experiences. 1857: The Government decides to form a Royal Commission to look into the disasters of the Crimean War. As women were not allowed to sit on such a commission she writes a submission to send to them. The Sepoy Rebellion in India draws her attention to the problems of sanitation. She is now ill with what would later be called post-traumatic stress disorder and she becomes bedridden only seeing visitors one at a time and never appearing in public. She is proposed to by Sir Harry Verney but declines so Sir Harry marries her sister Parthenope instead. 1860: The Nightingale Training School for nurses is opened at St. Thomas’s Infirmary with Mrs Sarah Wardroper as its head. Florence is now living in a flat in London and as close attention to this project. She becomes the first woman to be elected a Fellow of the Statistical Society for using statistics and graphs in nursing. 1861: She is asked for advice on nursing by the Union forces in the American Civil War. 1862: Florence publishes her “Observations” about sanitation conditions on India. 1864: She works on segregating men women and insane patients of the poor. 1865: She moves to Number 35 (now 10) South Street, Mayfair, London in October where she remains for the rest of her life. 1867: Nightingale works principally on rural hygiene and Indian sanitation. 1871: She publishes “Notes on Lying in Hospital”. 1872: The founder of the Red Cross Henri Dunant claims Nightingale’s ideas influenced him. 1874: Death of her father in January. 1880: Death of her mother in February. 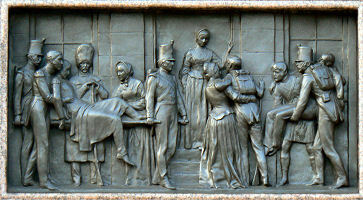 1883: Queen Victoria awards her the Royal Red Cross. 1885: She begins to nurse her sister Parthenope. 1887: Founding of the British Nurses Association. 1890: Death of her sister. Florence’s voice is recorded by the Eddison Company on a cylinder. 1896: She is now permanently confined to her bedroom. 1902: As she can now no longer read or write she takes on a secretary/housekeeper. 1907: Nightingale receives the Order of Merit from King Edward the Seventh, the first time it is given to a woman. 1910: She is no longer capable of speaking. 1871: “Notes on Lying in Hospital”. Never married though proposed to three times, lastly by Thomas Hoades a butcher/farmer from Lea. She felt marriage would not allow her to carry out her work. When and Where did she Die? 13th August 1910, London, England. St. Margaret’s Churchyard, East Wellow, Hampshire, England. There is a memorial to her in St Paul’s Cathedral, London. Lea Hurst, Matlock (now a Royal Surgical Aid Society Home). Queen Alexandra’s Royal Army Nursing Corps, Regimental Headquarters, Royal Pavilion, Farnborough Road, Aldershot, GU11 1PZ. (Has her lamp and Carriage). Florence Nightingale Museum, 2 Lambeth Palace Road. Claydon House (National Trust). (Home of her sister and brother in law). The Old Operating Theatre Museum and Herb Garden, 9a St Thomas Street, Southwark. Florence Nightingale Foundation, 199 Westminster Bridge Road, SW1 7UJ.